Trans people online are fond of accusing feminists who disagree with them of being hateful. However, if you pay attention to the interactions happening in various places, you will very rarely see feminists wishing death, disease and other terrible things on the people they disagree with. What you will find are trans activists doing this. ← Feeling urges to be mean, harm someone and take their things is normal and not bad!! Even more jealousy of women. That is terrible. It is NOT helping their cause to behave this way. I am a potential trans ally but not for people who bully and threaten others. I don’t know what Roseanne Barr said, if she was actually being offensive/mean or if someone just had way too sensitive feelings (some people are getting HOSTILE at the merest indication that someone might disagree with them on ANY issue so I’m not going to just assume that Roseanne said something wrong) but even if Roseanne DID say something downright nasty, it still does not pay to react with such hostility. If you want to point out bigoted or aggressive behavior, there are far better ways than to make yourself sound bigoted and nasty/hateful. Diplomacy works. 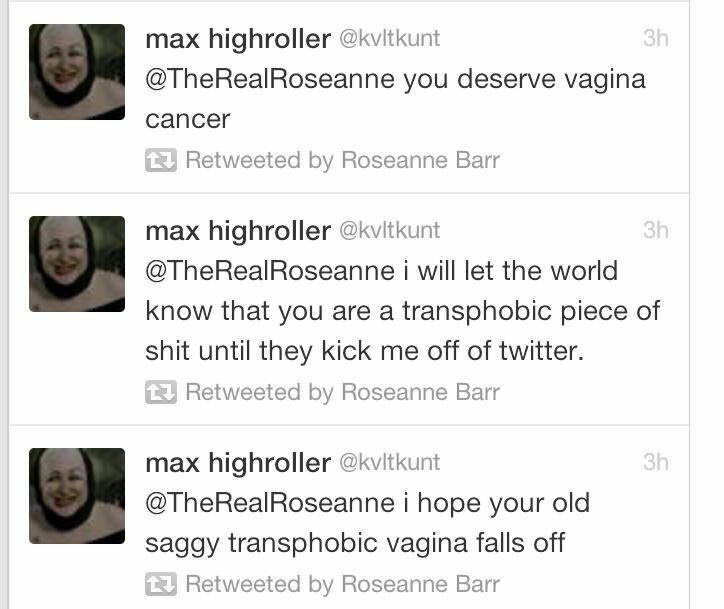 Roseanne Barr’s crime consisted of saying that people with penises should not use changing rooms for females. There’s plenty more, published every day on Twitter and elsewhere. It’s bizarre that men who want to be taken seriously as women behave in the most masculine way possible. They seem to have absolutely no clue what women are like and total blind hatred for anyone who is female. So how on Earth does it make sense that they “identify” as female? I just don’t get it. I would guess if you sought it you could find similarly unpleasany comments from radfems about trans ppl? You are welcome to try. Please report back. Most attempts I’ve seen bring back “misgendering” as comparable to the literal death threats that emanate from trans activists. This is not a select few. Those trans people who do push back against transmisogyny (trans hatred of women) receive the same treatment. Transmisogyny refers to the hatred of trans women, not misogyny displayed by trans women, which is a completely different issue altogether. How typical of transsexuals: infiltrating one more women’s space, the word “misogyny”. Misogyny, when the word is parsed out, literally means the hatred of women. I know trans activists laughably tried to tack on “trans” to the word to talk about hatred of trans women, but what they actually did was create a word that means the trans hatred of women. I prefer to use the word according to what it actually implies, especially given how common trans women’s hatred of women is. Transmisogyny, trans hatred of women, is the norm; trans women who identify with women, and not just as women, are the exception. Also, someone who hates trans women is exhibiting transphobia, homophobia, or misandry, not misogyny. No one hates trans women for being women unless trans women convincingly pass as women. When they pass as women, the hatred they experience is just misogyny. I’m sorry, I didn’t quite get your phrasing. What do you mean by receive the same treatment?